Cookies. You love them and you love them. When they are so high in sugar and butter, how not to love love love them? My hubby loves loves loves loves them. I'm not exaggerating. Hard, soft, chewy, gooey, whatever. What was left after 1 day. I should be grateful. Here is a little original recipe from me. I call them Ronni's Orange (and sometimes Lemon) Butter Cookies. Ronni's Orange (and sometimes Lemon) Butter Cookies. 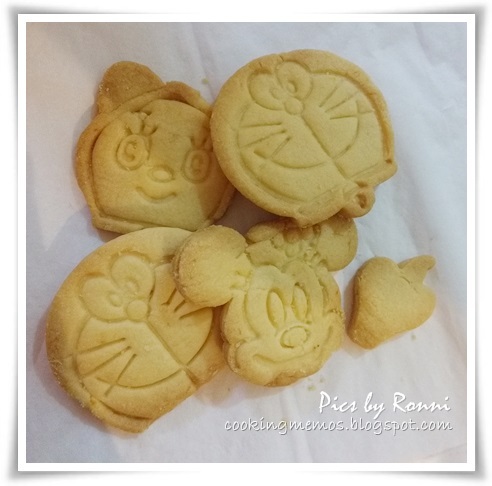 Use cookie cutter to cut out cookies. Dip cutter in some flour if dough keeps sticking to it. You can opt to chill in fridge for 20-30mins if dough is too soft.